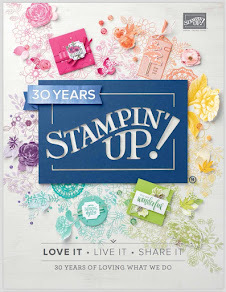 The following projects are both created using Stampin' Up's exclusive Petal Cone die. Each project needs two Petal Cones cut out - the points of which are trimmed off and an extra score line added to create the base. When cut, the Petal Cone resembles a heart shape. Fold it down the centre of the 'heart' along the scored line. Take note of the scored line towards the top separating the flaps from the body of the Petal Cone. Line this scored line up on your trimmer at 7.5cm (approx 3") and cut off the point. Line it up again with the scored line at 5cm (appox 2") and score a new line. Open your Petal Cone back out flat. You will see you have 3 small sections on the bottom of your Petal Cone. Remove the smallest of these on the outside edge by cutting along the scored lines - it is not needed. Then cut up between the remaining two sections - these will form the tabs for the base of your box. The colour combination used for this little 'Take Out' box is Pear Pizzazz and Daffodil Delight. The stamp set is the adorable Everybunny set. The image was watercoloured with the Aqua Painters and ink pads. The ribbon used is the Daffodil Delight 1cm Taffeta. This little Easter Basket is created in exactly the same way as the 'Take Out' box but the flaps this time have been folded in the opposite direction to create the open basket. The colour combination this time is Pear Pizzazz and Blushing Bride. 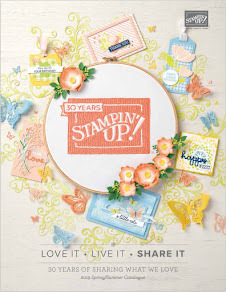 No stamping for this one :o) but I have used the 2011 - 2012 In Color Patterns Designer Series Paper stack to decorate the flaps and sides of the basket. I created the handle using the Dotted Scallop Ribbon Border punch. The ribbon Is the Pear Pizzazz Stitched-Poly. The beautiful Butterflies were created using the little Beautiful Wings Embosslit Die - another exclusive one from Stampin' Up! I cut them from little bits of paper from the same DSP stack and also from some Shimmery White cardstock (page 95 main catty). The edges of all the butterflies have been daubed using either Blushing Bride or Pear Pizzazz ink. Wow, I'm so glad I found your blog! I think I"ll be visiting often. Love your petal cone ideas and it just so happens that I have my friend's petal cone die sitting in front of me.